Awesome lakefront condo - 7.5 mile view of the lake. Remodeled. HGTV inspired. 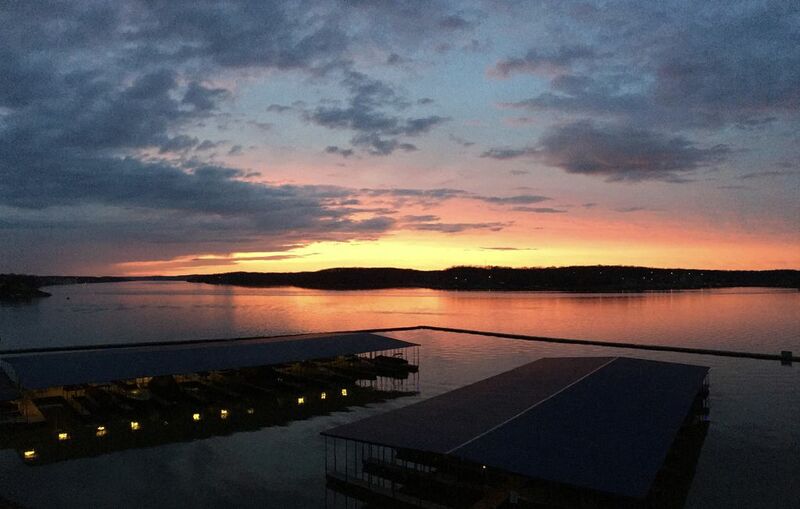 Gather with family and friends for a one-of-a-kind lakefront getaway (Lake Living), set before 7.5 miles of spectacular Lake of the Ozark views at Lands End Executive Condos. As the sun sinks into the lake and water laps at the shore, sip a glass of local wine on the balcony of your 3BR/2BA condo with a classic lake cabin feel. Then, head inside to gather around the custom stone gas fireplace and 55" flat-screen TV and drift to sleep on heavenly, pillow-top mattresses. Large Groups. With an additional Fancy Lake Vacations condo available for rent next door (3br/2ba condo - Feeling Nauti #1070776), groups can book both units together to accommodate up to 13 guests. Plan a multi-family gathering or a rousing reunion with friends; gather as a group during they day then adjourn to your own condo for a quiet evening. Confession: it wasn't always this rosy at the condo. When I purchased it, I found stark white paint, bare walls, and six-year-old beers in the fridge. But after an extensive, HGTV-inspired remodel fit for "Fixer Upper," I'm proud to have guests in the new "After" version. Now, the once-bare walls are home to 18 vintage oars, 8 repurposed skis, and even a vintage neon "Lake" sign—all collected with help from family. The full kitchen is equipped with new, high-end Whirlpool appliances and cabinets are stocked with cookware, dishes and dry spices. The old fridge—and the old beers!—are long gone from this chef-ready space. After dinner, don't forget to head out to the balcony for an uninterrupted, private view of sunset with not another condo in sight. Great for multi-generational getaways with sleeping space for 7 people, this condo is also handicap accessible. Pick from three bedrooms, each with a flat screen HDTV and its own unique character. In the master suite, hand-laid shiplap walls and sliding barn doors create an antique cabin ambiance, with a plush king-size bed at its center. The room's deluxe en-suite bath has a jetted soaking tub, dual vanities, and a walk-in shower. The Oar Room earned its name from the bed’s handcrafted, antique-oar headboard. Custom shiplap, a plush queen bed, 24” HDTV, and an en-suite full bath complete the ideal suite. Kids will rush to claim their bunk in the Ski Room, named for the vintage skis on the walls. With a twin-over-queen bunk, 32” HDTV, and an impressive supply of toys and games included, a family with little ones can settle in for a cozy night in the Ski Room. WHO IS THE CONDO PERFECT FOR? Boaters. A slip in front of the condo is available to rent—with zero steps required to access the dock. I'll even provide boat rental recommendations that deliver right to your rented slip. Families. Lands End Resort features two pools, a lazy river, playground and basketball court, one mile of lighted boardwalk, and a beautiful 5000 square foot clubhouse with an exercise facility. Shoppers & Diners. We're near the outlet shopping mall, new Dierberg's destination grocery store and the popular Pappo's Pizza & Pub. Golfers. Easy access to several top-rated golf courses. Guests of all ages. At this mobility-friendly condo, guests walk in from the parking lot and take a short elevator ride up just one floor. No stairs required to access the boat dock. Large Groups. With an additional condo available for rent next door, groups can book both units together to accommodate up to 13 guests. Plan a multi-family gathering or a rousing reunion with friends; gather as a group during they day then adjourn to your own condo for a quiet evening. Perched on the Lake of the Ozarks—voted best recreational lake in the country by USA Today—Lands End Resort boasts countless amenities to make your trip unforgettable. Meander down the lazy river, work out in the on-site gym, float in the pool, and splash in the waterpark. Mariners can rent a slip and sail onto the lake in a vessel from one of the area’s many boat rental companies. The town of Osage Beach is mere minutes from your door: stock up on groceries, pick up souvenirs, and explore new restaurants with ease. My family and I have been coming down to LOTO the last several years. Lands' End offers the best condos around so when I was ready to purchase I knew it would be here. We've had fun making this unit our home away from home and invite you to enjoy it. Lands' End offers the great pools and areas for kids. Our condo has awesome lakefront views. You won't find an exercise facility that can match this one. Elevators and a ramp offer no steps to the dock making this condo handicap accessible and easy to haul a cooler to the boat. The view is what sold me on this unit and I'm sure you'll agree once you see the sunset. You will love the amenities of a condo but feel as if you are in a lake cabin. The sunset is amazing from the balcony and you can sit all day and watch and listen to the boats on the main channel. Zero steps to the docks. Awesome lakefront views from the kitchen, family room, master bedroom and balcony. Beautiful lakefront view from your 3rd floor balcony. 180 degree main channel views. Lakefront viewing at it finest. Bath and kitchen towels provided. Pool and lake towels owners need to bring. Facility offers a great fitness room with bikes, treadmills and weights. Also has a TV. Coffee, salt & pepper, sugar. Assortment of spices. Dining table seats 6. Bar seats 4. Outdoor dining for 4. Each bedroom has a HDTV and cable. Family room has a 55" HDTV and DVD player. Bunk / ski room offers kids toys and welcomes you to leave any for future guests. 180 degree views of the lakes main channel. Dining area for 4 and 2 zero gravity chairs. Sit back, relax and view 7.5 miles of the lake. Kayaking and canoeing available at this lake. Bring your own and check out the nearby coves. Slip available for rent to park your boat. You can view the slip from the balcony. Unit is wheel chair accessible with an elevator. Dock slip offers wheel chair ramp. Lands End has 3 pools. Kids pool/park, Lazy River and Main pool with zero-entry and waterfall. The Condo is spacious, neat, clean and nicely decorated. Kitchen has everything you need for home cooking. The balcony has beautiful views of the channel. Elevator is a plus. Would recommend this beautiful condo to others. If you and your husband want to get away with the kids for a few days... then this is the place to stay! The condo is spacious and the wide open floor plan is a plus! The adults could be out on the balcony with some cool drinks And great food on the grill, while you have a clear view of the action inside. Great view all around !! We travel for work with our girls in our camper 9 months out of the year, and once we get that week off from work to get away, we always find a place to take the girls fishing with dad. This was our first time out at the Ozarks! Sunshine or rain there was something to do on and off the water, and Erica was great at finding out what her past guest did or what they enjoyed around Osage beach so she sent links and shared on her page what was going on around the area. Made this a lot easier for mama here to plan the days out so everyone has a good time. So again, the vacation was effortless and much enjoyed! Can’t wait to come back soon ! We love the property and proximity to the things we like to do. Eat and Shop! This condo is immaculate and has a fantastic view of the lake. The owner quickly responds to questions and has thought of every detail to make guests feel welcome and at home. This Lands End location is within 5 minutes of stores and attractions. I can't wait to come back! Joni - Thanks for choosing Fancy Lake Vacations for your getaway weekend with friends. I enjoyed hearing throughout your stay how much you enjoyed the condo and the lake. Looking forward to hosting you again in 2019! This condo is absolutely perfect. Beautifully decorated, super comfortable beds and great bedding, larger than it shows in the pictures, and perfectly situated in the Ozarks. So much to do, so close by: great grocery store right around the corner, great shopping blocks away, and right in the middle of all the attractions. The owner is so helpful and open with area info and advice. My family of 5 loved this 4-day getaway - so much relaxing fun. Highly recommend. Oh, and the view is spectacular. Additional Fees: $95 cleaning fee not included. Guests leave cash or check at checkout. $30 covered boat slip not included. Contact us for availability if needed. Rates subject to change at any time. Locked in at booking only. Check-in is 3pm, Check-out is 11am. No smoking, no pets, minimum age restrictions apply. Cancellation: 100% refundable if cancelled more than 60 days prior to stay. 50% refunded if cancelled more than 30 days prior to stay.